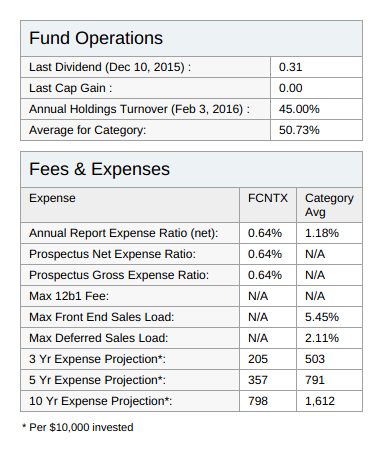 How to read a mutual fund's online prospectus like a pro (even without suit and tie). An in-depth look at mutual funds, part 1 — First introductory chapter: internal workings, the concept of NAV, growth vs. income funds, fees and taxes. What should I know about index funds — A type of mutual fund with a portfolio that approximates an index. Real estate investing with REITs, MLPs and mutual funds — A way of investing in lands and buildings without getting your hands too dirty. This is the second chapter of my open-end mutual fund analysis series. Here I want to tackle a mutual fund from the real world, analyze the chart, the publicly available information and see how to work with it. You can think of this article as the pratical part of the previous episode, where I dealt with the gruesome theory. For the purpose of my research I've randomly chosen an open-end mutual fund from the market. The picking turned out to be the Fidelity Contrafund. Managed by William Danoff from Fidelity Investments, it's one of the largest single-manager fund in the United States. Please note that I don't actually own a single unit of Fidelity Contrafund, nor I'm interested in selling you anything through affiliate marketing techniques. These are just hacking experiments made with real-world data! A prospectus is here to answer basic questions like: did the fund go well in the past? Will it do the same in the future? How much can I benefit from it? In other words, they all revolve around the concept of return: the gain or loss of the mutual fund in a specific period. In the first chapter we saw countless ways of making/losing money with mutual funds involving the capital gain, yields from the underlying securities and so on. Many variables come into play. For that reason the final amount of money in your pocket turns out to be quite tricky to compute. Let's keep it straight and clear: the mutual fund return is a measure of how much its value has changed over any given time period, including yield and distributions. The moral of the story: Internal Pointers return increased by 54.5% from 2100 to 2101. As with stocks and other securities, mutual funds are described through charts and data sheets, provided by the fund company itself and other public services such as Yahoo Finance or Marketwatch. For this article I've cropped some images from those websites and put up a sort of collage picture of the interesting sections. Every mutual fund (like any other tradable security) is unambiguously defined by a symbol made of a set of characters, usually letters, known as the Ticker symbol. 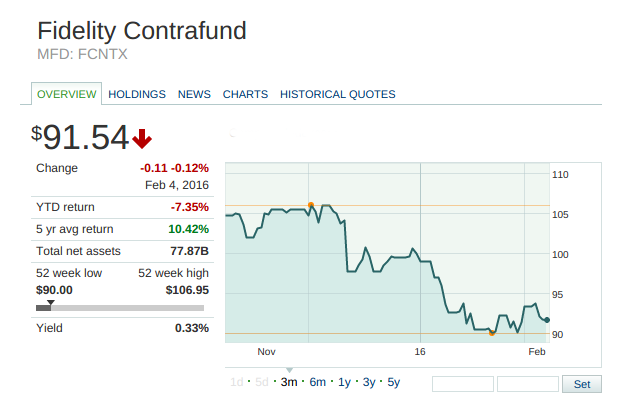 The ticker symbol for Fidelity Contrafund is FCNTX. Take care of that X at the end: all mutual funds' tickers have that letter at the end, so that they can be distinguished from other securities that also have ticker symbols. Usually a mutual fund technical analysis is made of several components, or tabs. In general they are news, summary, profile, performance, holding, risk. Of course there are no hardcoded rules for such structure, however I find it pretty useful and clear. Let's go through each one of those macro-categories and see how one can read them properly. Wait: where are my benchmarks? I will intentionally leave out every item related to benchmarks, Morningstar vs Lipper rating, style boxes and other technical tools: it's a rather broad topic that requires a separate article. You will find all that goodies in the next third chapter of this massive, yet exciting (at least for me) post series on mutual funds. No fancy stuff here: this is just a list of the most recent news regarding the mutual fund, its company and the market sector. The type and the quality of those news depends of course on what service you are relying upon. For example the websites I used for this analysis (Yahoo Finance and Marketwatch) seem to just spider their news sources matching the ticker symbol. The official page on the other hand does not offer such service. Instead I've found a quarterly fund review, a Q&A section with the portfolio manager and a chairman's message. Those information apply only for the Fidelity Contrafund official website of course, and they may vary for others. This section contains general information such as current NAV, returns, fees and expenses, small charts. In the picture 1. below most of the area is covered by a graph that shows the current NAV per unit, in dollars. Note also how the mutual fund name is always accompanied by its ticker symbol. 1. Mutual fund overview sheet. This section gives you a detailed look of the mutual fund's composition, management information, more precise expense data. Here you might find the fund overview, management information and facts on operation and expenses. A general profile box as shown in picture 2. is often used as a global recap of data already available in the summary section we have seen before. 2. Mutual fund general profile box. fund inception date — when the fund was born. 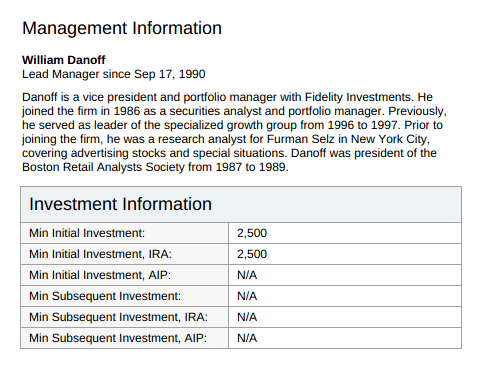 The investment information box (figure 3. below) usually contains the biography of the mutual fund manager, that is William Danoff in this case. You may want to get to know him better, at least virtually, since he is the guy that would manage your money. In this section you also find the minimum initial investment. Here it means that, for the first time, you have to buy at least $2,500 of fund units. There are no lower limits for subsequent investments. The table also reports data in case you are planning an IRA or an AIP, two types of retirement plans available in the United States. 3. Mutual fund investment information. 4. Mutual fund operation and expenses. 3/5/10 Yr expense projection — if you own today $10,000 of Fidelity Contrafund units, how much you will pay in the next 3/5/10 years in terms of expense ratio? This sections tells you how the mutual fund is going on. Usually you may find a general overview report and more in-depth detailed information. best/worst 1/3 Yr total return — the total return is how much the fund earned (or lost) in a given period of time (here 1 or 3 years). 5. 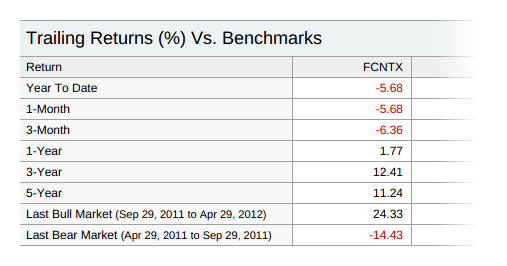 Mutual fund performance overview. This box tells you how much of a return you would actually see, once all fees have been subtracted from it: simply think of it as the net return. The table in picture 6. reports such data for 1, 2, 5 and 10 years. Namely, in 10 years you would have gained a pure and clear %7.49. 6. Mutual fund load adjusted returns. The previous NAV of course depends on the time range. 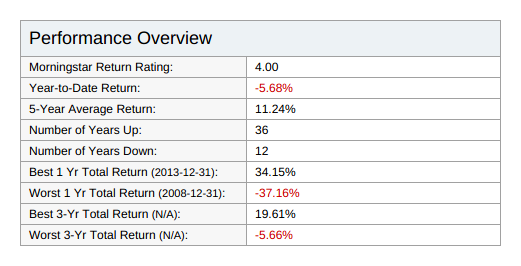 For example, in 5-year trailing returns, the previous NAV dates back to 5 years ago from now. Note also that any dividend that would be reinvested or expenses that would lower your return must be included as well. 7. Mutual fund trailing returns. Comparing your mutual fund to its category average is always useful in order to check if the fund is good enough. For example if the category average has a trailing return of 8% but your fund is set to 2%, you may want to keep looking in that category for a better alternative. Index comparison is another valuable idea: is the fund able to outperform the index? If not, it may be smarter to invest in an index mutual fund following that index. In the Performance section you might find other detailed reports such as the Past quartely returns, past returns in a three-month time frame or the Annual total returns, past returns for each year from the inception date. Those are just big chunky tables filled with data, too bulky to be reported here but easy to understand. This section provides a detailed description of the mutual fund's security pool. Here you usually find reports on market sectors, the top N holdings, the asset allocation (the quota of each security) and the regional diversification, a table of countries or regions which the fund may invest. All those data may be used for revealing the mutual fund's investment strategy. For example: if you see a heavy bond exposure, it may reveal an income orientation. Otherwise a large percentage of security in cash might indicate a defensive position. In knowing a fund's composition, you can be sure that you are getting the type of fund you are looking for. Picture 8. below shows which markets the fund is investing into. As you may see for Fidelity Contrafund the major sectors are IT, consumer discretionary, financials and health care. On the rightmost part there is a comparison with an index, the S&P 500 in this case. 8. Mutual fund major market sectors. Here you will find an excerpt of the underlying assets. The official website of Fidelity Contrafund reports the top 10 holdings in which the fund had its largest investments. They state that this information is updated quarterly, with a one-month lag. For other funds, this information is updated based on the disclosure policy of each company. 9. 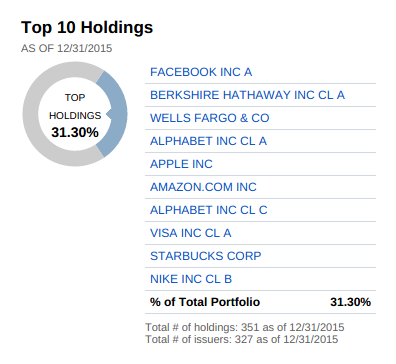 Mutual fund top holdings. bonds, cash & other assets — you guess what. 10. 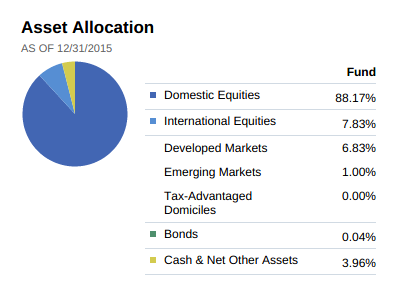 Mutual fund asset allocation. The picture 12. below lists the countries the mutual fund is investing into. We saw before that Fidelity Contrafund handles also a small part of cash: the leftmost table shows what currencies are actually managed. 12. Mutual fund diversification tables. This section shows you how much the mutual fund is volatile, generally with tons of reports and fine data. Here you may also find some advanced mathematical concepts, if you are inclined. Most of the items here have been already faced in previous sections. Morningstar risk rating, the only new entry here, is a measure of a fund's level of risk, relative to similar funds. The rating goes from 1 (not so risky) to 5 (risky) points or stars. Such rating measurements will be covered thoroughly in the third part of this article. 13. Mutual fund risk overview. r-squared — it measures the correlation between the mutual fund and the reference index, in percentage. The higher the r-squared value, the higher the similarity of the mutual fund's price to the S&P 500. You may use that value to choose a mutual fund that follows or not the standard index. Treynor ratio — it basically answers the same question of Mr. Sharpe, but internally uses β instead of the standard deviation. What's the difference: since β works in relation to the market index (while the standard deviation works in relation to the specific fund), Treynor ratio takes into account the market as a whole. 14. Mutual fund modern portfolio theory statistics.